Alabama remains the unanimous No. 1 in the AP Top 25 and Coaches Poll released on Sunday following Week 5 action, receiving 56-of-61 first-place votes in the former and 58-of-64 first-place votes in the latter. The Florida Gators, which entered the season ranked for the first time since 2013 at No. 25 in both polls but fell out of the AP Top 25 three weeks ago, ascended in the Coaches Poll and held steady in the AP Top 25 despite not playing last weekend. The Gators checked in at No. 18 in the AP Top 25 and No. 14 in the Coaches Poll (up four spots) with 483 points (up 92) in the former and 661 points (up 171) in the latter. Seven SEC coaches are voting in the Coaches Poll this season: Bret Bielema (Arkansas), Gus Malzahn (Auburn), Derek Mason (Vanderbilt), Dan Mullen (Mississippi State), Nick Saban (Alabama), Kirby Smart (Georgia) and Kevin Sumlin (Texas A&M). Malzahn, Saban and Sumlin all voted in 2015. Saban has been a voter since 2013, while Sumlin began in 2014. 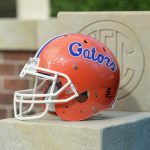 For the second straight year, UF will see coaches from five of its 12 opponents voting in the poll: Bielema, Mason, Smart, Jimbo Fisher (Florida State) and Seth Littrell (North Texas). Urban Meyer (Ohio State) is also a voter. All opponents are italicized. Red for losses, blue for wins.